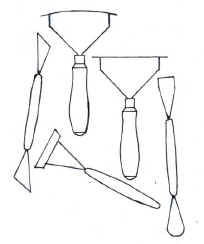 The various tools that are used for shaping the clay can either be purchased or made by the individual. also makes them stand out amongst the rest. The shapes to produce the tools are based upon standard forms which have been established over the years. With exception to specialized tools which are developed by the individual for unique situations that may arise during the modeling process. With this in mind, I will proceed to make certain tools using basic materials and equipment. With all of the tool making processes be sure to use the appropriate safety measures and safety equipment for an enjoyable experience.